Longtime reader Femme1 – aka Deb – has sent in photos from her Mom’s house. The house includes a time capsule message hidden behind the medicine cabinet – the best! 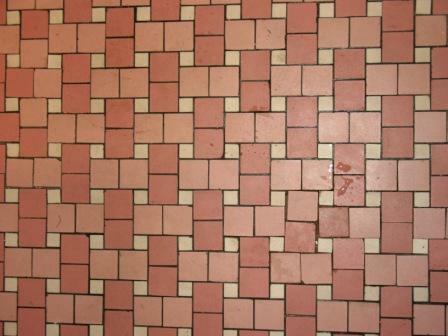 Yummy bathroom – note the floor and how it combines 2×2’s and 1x1s [Deb notes that this picture was taken as she was removing gray paint that had dripped on the floor years ago ]. When you get to the Gallery of photos, take a look at the bathroom and how it combines pink and blue — they look great together. These 50s pastels were so versatile. And yes, how about that front door – swoon! Erwins – what do you think? Here are the long promised photos of my Mom’s bathroom from her 1957 ranch house. It’s not completely original, and the sink and cabinet were replaced a long time ago. I also threw in pics of the front door and trim. If she ever sells the house, I’m taking the door with me! I’ve never seen such an intricate window in an M-C house. There’s also a pic of a message my husband found when he was replacing the bathroom medicine cabinet. The house was built by an Italian man, and it has all sort of ceramic tile details (see the pink and blue tile with marble strips on the front porch) and lots of pebble planters. 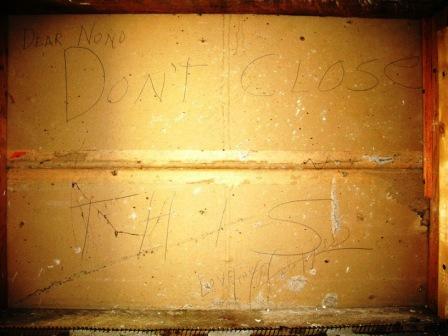 The message says “Dear Nono” (Italian for “grandfather”) “Don’t close this. Love, the Voloppis.” I felt like we’d uncovered something archaeological! Apparently, either his grandchildren or someone else close enough to call him Grandpa helped with building the house. Check out that wicked door! That was found on a site for a Toledo, OH, resale shop. What we have found over time is that stuff like this varies greatly regionally — chances are good there was a really talented artist in that area who knew how to do that kind of millwork! We haven’t tried reproducing such shapes… yet 😉 The tricky part is repairing the door in the event that something happens (broken glass, ripped veneer, etc). But it sure does give us some food for thought! Thanks so much for sharing!!! Your welcome, everyone! I wonder if it was a regional trend—my mom lives in north central Pennsylvania. Not exactly close, but in the same northern industrial belt as Buffalo and Toledo. And Christiane is right; the millwork on this door is pretty intricate. Now I wish I’d taken a closeup. And Pam, I hope you noticed the glimpse of the early American furniture in that photo of the door taken from the inside. That’s my mom’s dining room. I’m finally beginning to appreciate that style, thanks to you, after growing up EA’ed out! Oh my heavens – I love that door more than….well chocolate! Erwins, get busy! I don’t even care if the door can’t be repaired! It’s FABU! 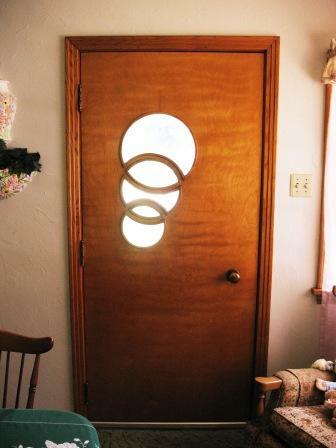 Great door! I’ve never seen one like it. However, having grown up in Toronto Canada’s “Little Italy” , (now quite gentrified), I have known quite a few amazing Nonnos and Nonnas. They came bringing their culture, their wonderful food and their old-world craftsmanship skills. Our neighborhood’s houses were painted in bright and cheery colors. Some folks thought it was in bad taste, but in my opinion they were bringing a little Mediterranean sunshine to chilly Canada. Thanks for the great memories and pics.